Tip: Always wear a ventilated dust mask or respirator when performing bodywork. The airborne debris and toxic chemicals found in many products are extremely hazardous to your health. Performance gains: Bodywork is all about looking good, and there’s nothing wrong with that. Adding bodywork to your set of skills is huge, and can save you thousands of dollars over time. Bodywork can be a scary thing. Most of us would prefer just about anything than the painstaking task of hammering, filling, and endlessly sanding away on some slab of steel. Honestly, it just doesn’t sound like fun, nor does it make you go any faster. Still, the fine art of bodywork and metal fabrication is always in high demand. Visit any reputable body shop and chances are the lot is overflowing with work to be done. 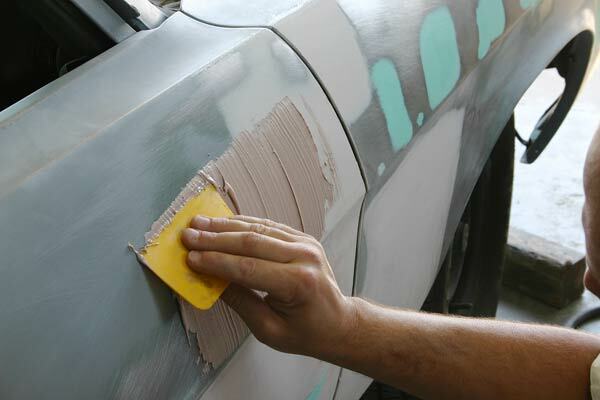 Bodywork can be extremely intense labor and very time consuming as well. It’s not uncommon for some custom projects to take years! 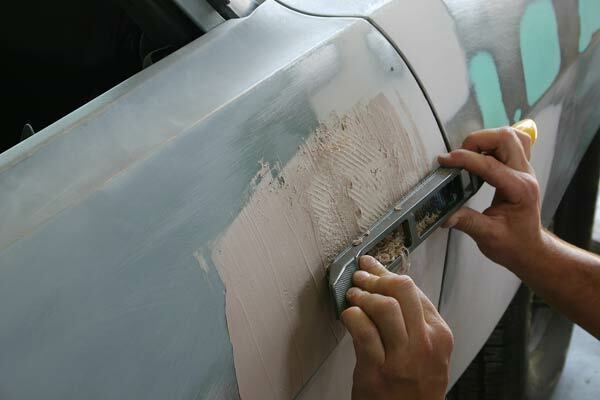 If you’re starting from scratch, first remove any body moldings or trim items that will interfere with the work. Label your hardware and set it aside, out of the way. Grinding is typically the first step in the preparation process. Using a power grinder and some 36-grit sandpaper, grind out an area on the body larger than the actual problem area. This allows plenty of room to smoothly blend in the filler. 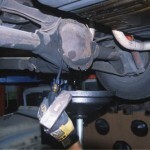 After the area has been marked, use a wire wheel and thoroughly clean the surface of all rust, debris and residue. It’s important to have a clean, bare-metal surface to start. 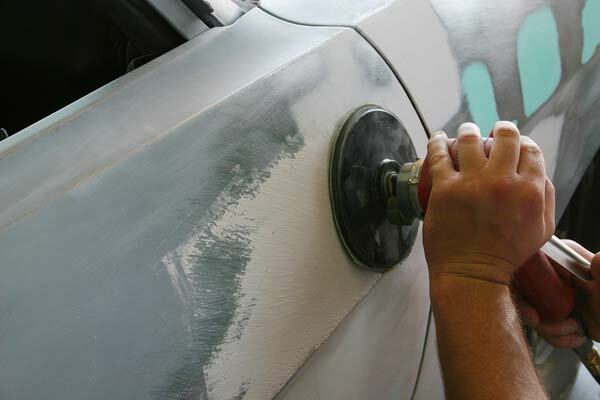 Mixing the filler and hardener should be done on a clean surface. Once the two are thoroughly blended, waste no time in applying to the body. The hardener tends to “set up” rather quickly. 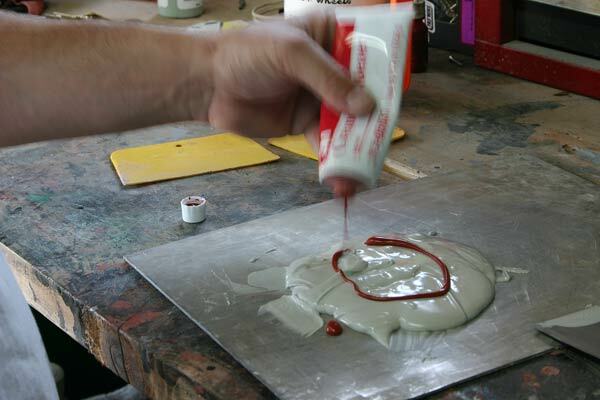 With the applicator, evenly distribute the mixture on and around the area of repair. After the filler hardens, we used a rasp file to get rid of the high spots. You could also use a block sander and some burly 36-grit sandpaper. Using some type of straightedge (a yardstick works well, or 12” ruler for smaller areas), examine the extent of the high or low spot on the body panel. This will help give you an idea of how much filler to mix up. Once the amount has been determined, grab a clean pan or piece of cardboard and mix the filler/catalyst. Follow product instructions for the amount of hardener to use. If you are spot-fixing a particular area, be sure to mask off the rest of the panel with masking tape and paper. 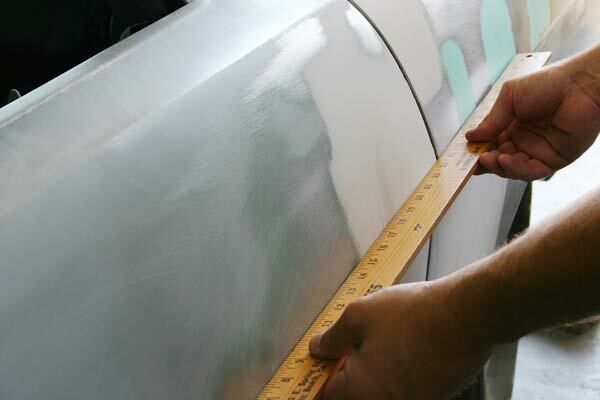 Using a squeegee applicator, evenly distribute the filler on and around the area of repair. When the filler is almost dry (a slight drag is ideal), use a block sander with 36-grit paper to “knock down” the high spots in the filler. Be careful not to go too deep– about 1/3 of the way down is all you need to do at this point. Here we use 80-grit on the sander to start creating a smooth surface. Either by hand or with a sanding disc, carefully blend the surface with the higher grit sandpaper– periodically checking the finish. We went from the 80 to the 150, 240, and the 320 grits. The final step in the sanding process is with a sheet of 400-grit. 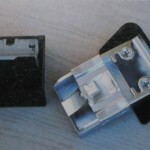 This determines the actual finish of the panel prior to sealing. The area is now level and smooth, ready for primer. 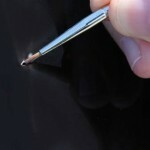 After the 36-grit, follow up with a finer 80-grit paper to smooth out the scratches from before. It’s best to sand back and forth across the treated area at 45-degree angles. Now comes inspection time. Preferably using an air compressor, blow off the sanded area and inspect the surface and the remaining ridges in the filler. If they are left on the surface, they will also be seen in the primer and eventually the paint. Re-sand the entire area with a fresh strip 150-grit paper. From there, move up to a 240-grit. You can move from the 240 up to 320, then the final 400-grit, or go straight from the 240 to the 400 (depending on how smooth the area is looking). 400 should be your final sand in preparation for primer and paint though. Make it clean and smooth. While you’re at it, slightly blend the surrounding areas with the 320-400-grits as well. This will help transition the repaired section with the rest of the panel. After the sanding is complete, repeatedly wipe down the surface with a clean towel and some wax/grease remover. This will rid the surface of any lingering contaminants. The newly restored panel is now ready for the sealer/primer of your choice. 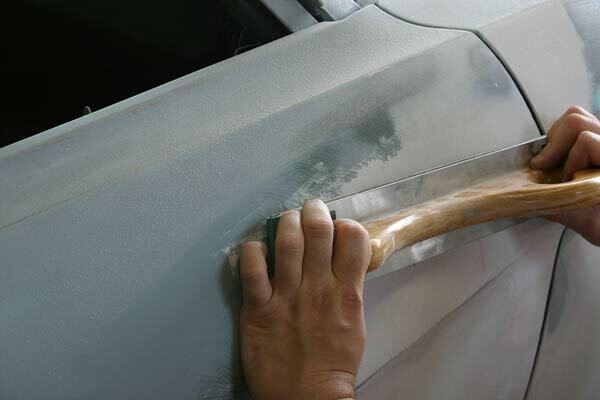 Consult a reputable body shop or body shop supply store for advice on which sealers and primers will best suit your needs. 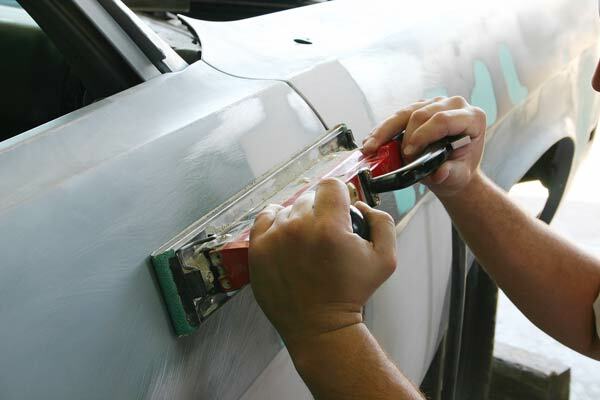 Specialty tools play a big part in bodywork projects. 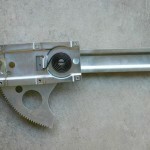 The basics include block sanders, grinders, an air compressor, and a ball peen hammer (for hammering out harder-edged dents). Most of these items are fairly inexpensive and can be found at any supply store. Every car enthusiast should own an air compressor. The come in handy and dramatically simplify so many jobs. This would be a good time to step up and purchase one. 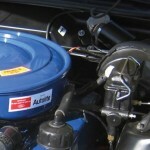 If not, compressors can be rented from parts stores and rental companies.